As an active Premium member of LinkedIn, I start new discussions and also contribute to many on-going discussions as a way of expressing my opinion and offering my experiences. Recently one of the most commented on discussions has concerned the current thinking on pupils/students using their mobile phone devices during class sessions. Over 95 and rising comments were posted on this subject. For a LinkedIn discussion, that’s heavyweight. This is an issue that wouldn’t have taken place five years ago because mobile devices were not as ubiquitous amongst the young as they are now and certainly won’t be taking place in five year’s time because by then handheld devices will be an integral technology within every classroom. But for now, teachers and trainers are concerned as to how they go about “policing” and controlling pupils’ devices. What’s interesting is that comments from contributing teachers around the world essentially fall into two camps. The first camp see the devices as intrusive and unwelcome and teachers in this group appear to be one step away from confiscating them at the start of a class session. The other camp view their students’ mobiles as a potential technology resource and are actively encouraging their use for note-taking, internet searching and fact finding. This second camp is the way to go. Many progressive schools and colleges already operate pupil BYOD (Bring Your Own Device) policies. Saving huge amounts of budget in not having to provide their students with handheld technology and eliminating risk and responsibility for loss, theft and damage. However. Unless you believe in a totally unstructured free-for-all classroom, it’s clear that the teacher/lecturer/presenter must have some degree of control over what the students are looking at on their devices and how they are using them. Otherwise digital anarchy will reign! Step forward Display Note. Display Note software allows users to present, share and collaborate on any device and across multiple platforms. Users can capture the presenter’s content, add their own notes and annotations and collaborate with other connected devices. 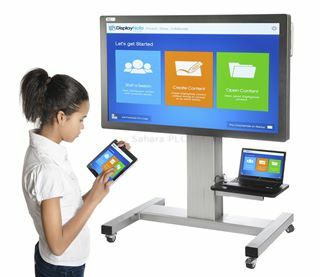 Teachers and presenters can use DisplayNote as a wireless presenter tablet to send messages and content to connected devices and to view the screen of any participant in the room. Display Note can be seen on this website (click on the Software tab on the Home page) or you can contact me direct at cot@marsdengrant.com to arrange a free trial and for further information. So my message to teachers and trainers is unequivocal. There’s no need to see your pupils’ handheld devices as a threat or a distraction to your teaching or your authority in the classroom. Use and exploit their existence to your own and to your pupils’ advantage. Embrace the future in your classroom today. All displays and devices singing off the same song sheet!